Urine stains on a mattress are one of the hardest stains to deal with, not so much because of the discoloration (the mattress itself is usually covered) but because the urine can soak deep into the fabric or foam and cause ongoing odors. More than one homeowner has thrown away a mattress in frustration after being unable to remove the odor. Yet any family with pets, small children, or older adults with control problems deals with this problem from time to time. 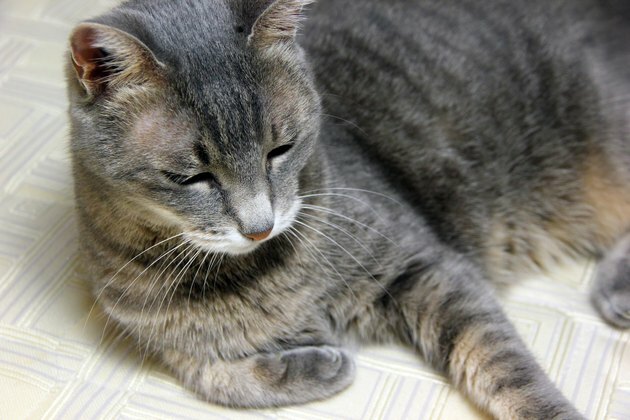 If you have pets, it's likely you've dealt with pee stains on mattresses or furniture cushions. There are two common ways to deal with this problem. First, there are a variety of enzymatic cleaners available. These products contain plant-based substances that actually digest the uric acid crystals that form urines stains and odors. The odor is not just being masked but is actually being digested away. These products are very easy to use with a one-step application, but they are also very expensive, meaning that you may want a less expensive option. The second, less expensive method is quite effective, though more time-consuming. It requires ordinary household items: paper towels, white vinegar, a spray bottle, a fan, baking soda, and a vacuum cleaner with a hose attachment. Let's start with the less expensive method using household items. Gather the supplies needed: rubber gloves, a bucket, cold water, vinegar, baking soda, detergent, paper towels and a vacuum cleaner with a hose attachment. A fan or blow dryer will also come in handy to help dry the mattress when you're done. If it is still wet, blot the stain gently with some paper towels. Soak up as much of the urine as you can. You may want to wear rubber gloves. You can skip this step if the stain is dry. Mix together 2 parts cold water and 1 part vinegar. Place the mixture in a spray bottle and spray it heavily onto the stain area. (You can also just dab it liberally onto the stain area.) Wait about 15 minutes for the vinegar mixture to work on the stain and the smell before moving on to the next step. 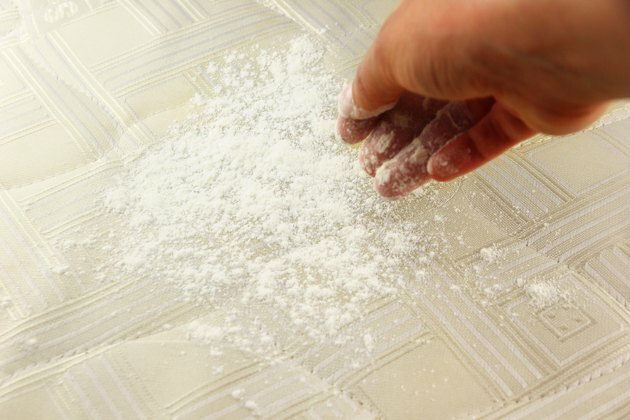 Sprinkle baking soda liberally over the stain and allow the mattress to sit undisturbed for a full two hours—overnight is even better. The baking soda will be absorbing the vinegar and dissolved urine. 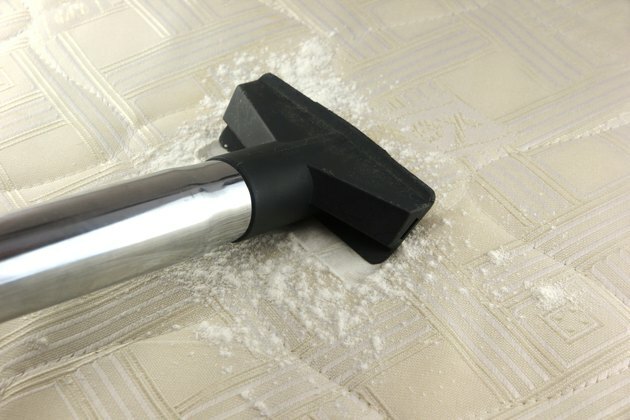 Use the vacuum cleaner with a hose attachment to lift the baking soda off the mattress. 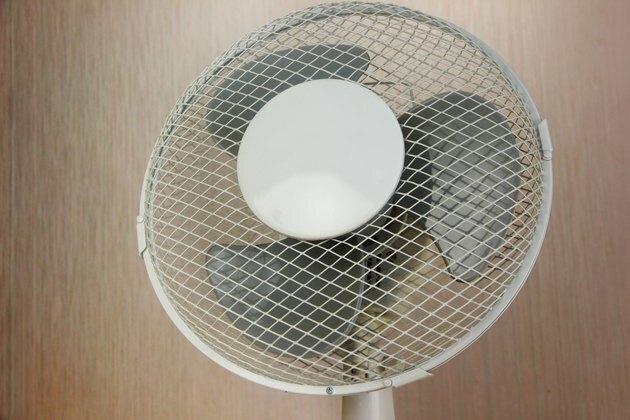 Open a window or set a fan in the room to allow air to blow across the mattress. This speeds the drying process. When the mattress is completely dry—it usually takes at least overnight—remake the bed. When you do, consider adding a waterproof mattress cover to make future accidents even easier to clean up. Although the vinegar-and-baking soda method works most of the time, urine can be difficult to remove if it is set in. 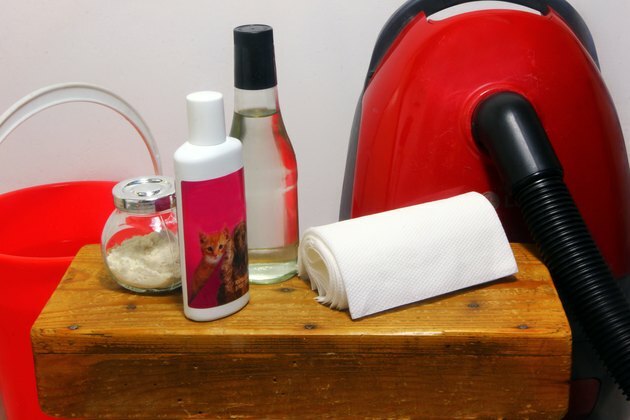 You may notice an odor after cleaning up dog or cat urine. If you do, use an enzyme-based cleaner from your local hardware store or veterinarian to remove any lingering odors. Soak up as much of the urine as possible by blotting with paper towels. 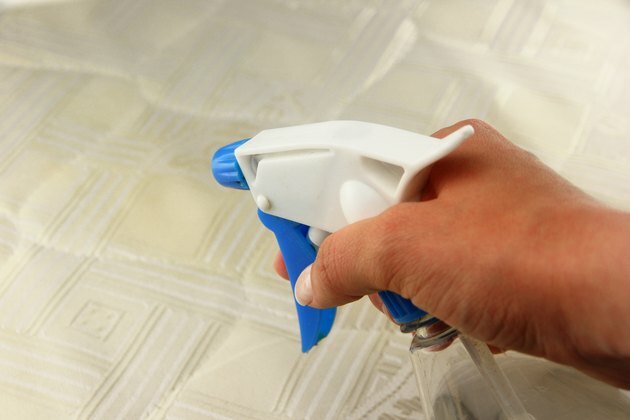 Apply enough enzymatic stain remover to ensure that product soaks through the mattress to the same depth as the urine. Over-application of stain cleaner is fine in this case. Allow the mattress to air dry. After the odor and stain are removed, remove residue by applying a small amount of water to the area and blotting it up with a paper towel. Make sure to remove the residue or the area may attract dirt. Apply enough cleaner to ensure that it soaks through the mattress to the same depth as the original stain. If the stain is old or very stubborn, saturate the area and cover with plastic wrap for 24 to 48 hours. This allows the cleaner to stay moist and work longer. Don't be surprised if the urine odor gets more intense at first—it indicates the old urine is being drawn to the surface. Allow the mattress to air dry, at least overnight. If the stain is still visible, repeat application daily until it is no longer visible. It can take three or four applications if the stain is very deep. After the odor and stain are gone, remove the residue by applying a small amount of water to the area and blotting up with paper towels. Remove any residue, which would otherwise attract dirt. Long-term or heavy exposure may "burn" urine into fabrics. If this is the case, it may not be possible to completely remove the stain and odor—your only choice in such situations will be to replace the mattress.